Location is one of the top selling points in real estate, and it can also be the most important consideration when looking at property maintenance. For Phoenix business owners, you have a lot of sunny days and high temperatures, which can mean serious maintenance challenges for your parking lot. Your parking lot is often the first thing potential customers see, so it important for it to stay clean and in good repair. You might start looking for a commercial asphalt repair company when you start seeing damage to your pavement, but what is causing the problem? Asphalt in Phoenix often shows wear due to the high temperatures and endless hours under the beating sun. While the freeze/thaw cycles is a problem in other areas, in Phoenix, the biggest culprits are water and heat. In addition, a failing base layer can mean a poorly installed surface from the start. 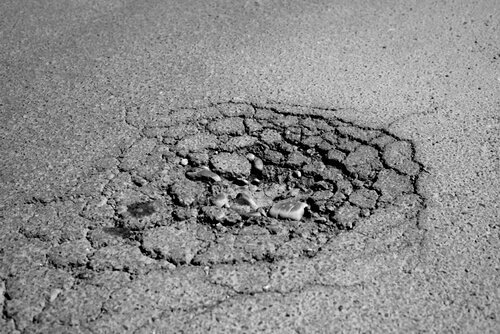 Asphalt paving typically shows wear in one of two basic ways: potholes or cracking. The sun can speed up cracking, leaving weak spots on the surface that are vulnerable to seepage. Over time, water will widen those cracks, leading to potholes. When cracks first appear, you have the opportunity to fix them before potholes develop with an overlay. If you have potholes, some may be easily filled without needing to tackle the entire surface. If the base layer is failing, full removal and replacement is likely your best option. With many types of repair available, it is important to have your lot assessed by an expert. A smooth, black, asphalt surface with clearly defined striping is an asset to your business. Not only does it tell customers you welcome them, but it also means less liability. Trip and falls are much more likely on a broken surface with uncertain footing. By keeping your asphalt in good repair, you keep your business safe from premise liabilities and boost your curb appeal to customers. When you need asphalt repair, you need a company that has lots of experience dealing with Phoenix weather. At One Stop Asphalt, we know the Phoenix area and routinely work to lay asphalt lots designed to stand up to the heat of an Arizona summer. Let our expert technicians diagnose the cause of your problem and recommend the right commercial asphalt repair. Contact us today to schedule an inspection.